Over the years I have attended thousands of car shows throughout the world. Venturing out to see different builds and finding something unique is getting harder and harder, because of the internet. It’s an easy way to display your work and promote yourself, but at the same time you are taking away the element of surprise. Your work would normally be unveiled at an event or a feature in a magazine, but with one simple click of a button, your build is out there for all to see. The past 2 years we have attended SEMA and it never disappoints. While most are at home on their smart phones looking at pictures, there’s nothing like seeing an unveil or a well executed build in person. That’s when I came across Hank Robinson of Hanro Studios. 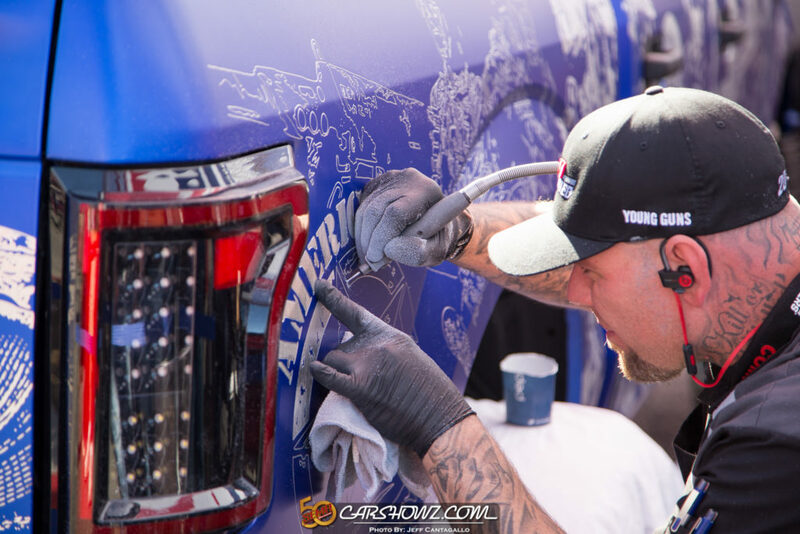 As I made my way outside during SEMA 2016, I came across the American Force booth and found Hank “drawing” on the side of a new F150. My immediate reaction, “what the hell”, but as my eyes focused in on what Hank was doing, the military themed design caught my attention. After serving 6 years in the U.S. Navy myself, anything military / Veteran related catches my eye. While I served shore duty all 6 years and was not involved in combat (maybe a paper cut here and there) I have mad respect for those who have been and are on the front lines. Freedom Blues is the name for the F150 Hank was working on and a tremendous tribute to the military! As I looked closer, I can see and hear the Dremel doing it’s thing. Hank looked like he was in his own world, focused with his Beats ear buds fastened to his ear and not a worry in the world. As I stood there watching, I tried my hardest not to look like the ultimate fanboy, but the amount of time and energy put into this was an awesome sight. As I got caught up into Hank’s work, I almost forgot to take photos. If as though Hank’s work is not fascinating enough, after looking into more of who Hank Robinson is and what Hanro Studios is all about, I’ve became even more of a fan. Hank is a U.S. Army Infantry Veteran with tours in Kosovo, Iraq and Afghanistan. 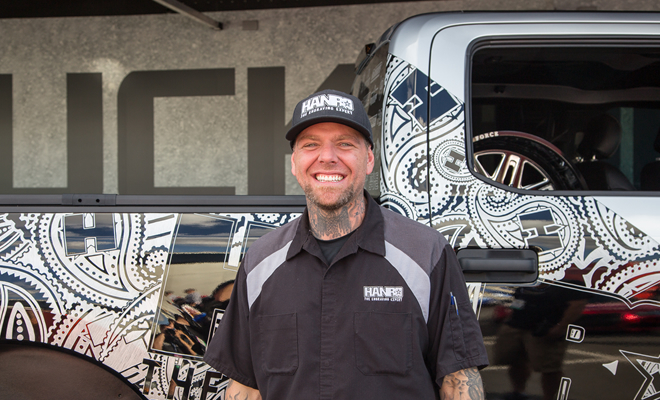 Using his GI Bill to attend and graduate from Combination Welding School at Arizona Automotive Institute, it all makes sense as to how Hank’s creation came about. The work that is produced from Hanro Studios is very impressive, the attention to detail and the creativity that comes from Hank Robinson is amazing. Like most Veterans who separate from the military, most do not have a job skill that can be easily translated into the civilian sector. Hank solved that issue for himself and others by creating Hanro Studios. Hank is actively involved with several Veterans organizations, including an exclusive PTSD Art therapy course with the Wounded Warrior Project. Not only does Hank have a new found passion, he has shared his passion with other Veterans in hopes they can find peace and a purpose within Dremel art. Fast forward a bit into 2017, as I follow Hanro Studios Instagram and Facebook pages, I see that there is a new project on the horizon. 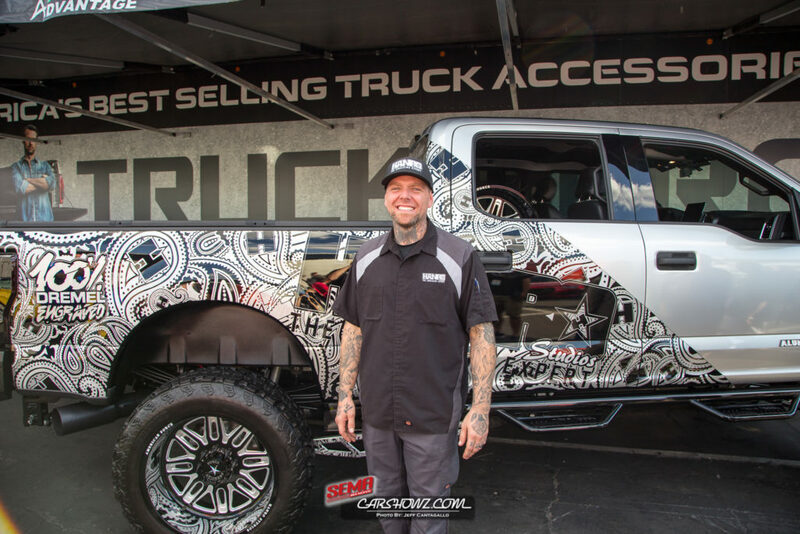 The Aluminati, a brand new F250 was in the works for SEMA 2017. I forgot to mention, Hank is one of the humblest guys I know. He is very interactive on social media with his fans and every time I have ran into Hank, he always has a smile on his face and is willing to take the time to chat with you. Hank’s personality is very contagious and he leaves you walking away thinking, “I need to go and do cool sh*t like Hank!” and whatever I learn, I need to pass it on and help others. If you get anything out of this article, keep in mind your attitude and the way you treat others definitely has an impact (#belikehank). 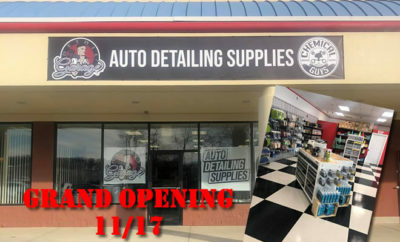 It was definitely worth the wait and while I was standing there watching Hank do what he does, another thing I have learned about the man behind Hanro Studios. Hank is a patient dude and while the folks who were interviewing Hank needed additional takes, etc. Hank stood there with a big smile on his face as patient as could be. As the media crew dispersed, I had a chance to chat with Hank for a bit and grab some detailed shots of the Aluminati. The F250 project turned out just as amazing as Freedom Blues and there’s no doubt that Hanro Studios, Hank and his family will continue to be successful for years to come. Below are a few shots of the Aluminati I captured from SEMA ’17. I’m always appreciative of the opportunities presented to me, especially ones like this to be able to meet an Artist and be able to capture the moments and preserve automotive history. 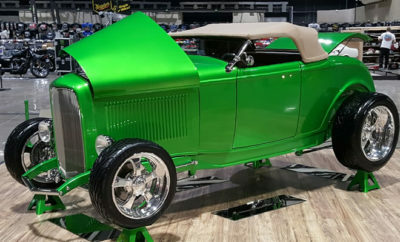 At least that is our goal here with CarShowz, to use our small footprint within the world and share awesome stories like this. Thank you for doing what you do Hanro Studios!